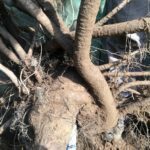 It isn’t always necessary to bare root a tree before planting, but in some cases, it’s crucial for the tree’s good health. 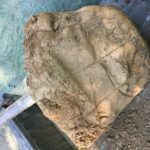 The tree in the photos below probably came from the southeastern U.S., based on the heavy clay soil that is visible. Here in the northeast, most of our soils are significantly different. 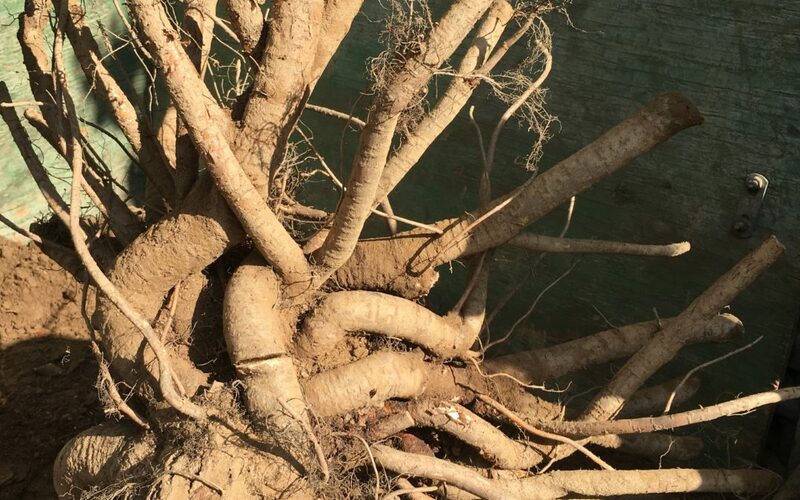 In the planting site for this tree, the soil had high organic matter and was extremely well-drained. 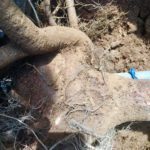 Without proper preparation, there was a low chance for this tree to thrive in its new home. 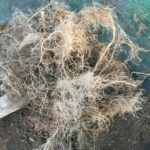 Since the soil at the planting site was so well-drained, water wouldn’t have a chance to soak through the clay to the roots. 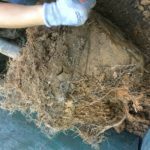 We chose to completely bare root the tree and in the process, found a snarl of roots. We cut several roots so the tree wouldn’t girdle itself and untangled a few more. The tree was planted in its new location and it settled in well. It was worth the extra time! Native plants have traditionally been overlooked in formal design. People often equate native plants with being messy or at the very least, wild, yet there are many native plants that are perfectly suitable for formal landscape design. 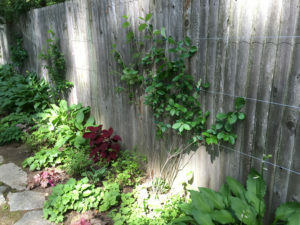 As an example, is this Aronia arbutifolia (red chokeberry) which I’ve espaliered on this client’s fence. 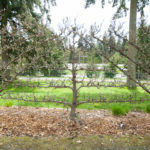 The technique of espalier is used to train a tree or shrub flat against a wall or fence. 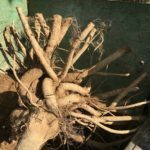 It is generally used for fruit production and the intense pruning required of espaliered fruit trees allows for bountiful production in a very small space. 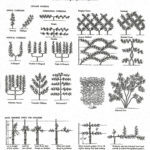 Espalier is also often used to train vines, like ivies, into intricate or geometric shapes, purely for the visual effect. Two-year old red chokeberry being trained as espalier. The photo to the left shows a young Aronia arbutifloia after it was attached to guide wires. This client needed a small plant species that could easily be maintained at 6-8 feet tall and could tolerate extreme shade and dry conditions under mature oak trees. 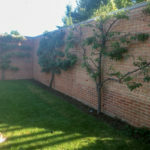 Both Aronia arbutifolia and A. melanocarpa have supple stems that make the process of espalier even easier, since there will be less pruning required to maintain the desired vase shape in this installation. 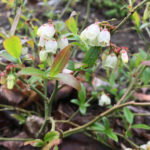 These native varieties also offer great three-season interest with early white blossoms, glossy green leaves, red berries, and rich red-orange autumn colors. Suggestions for other native trees and shrubs that could be espaliered include: Aesculus parviflora (bottlebrush buckeye), Amelanchier (serviceberry) species, Cephalnathus occidentalis (buttonbush), Cercis canadensis (redbud), Chionanthus virginicus (fringe tree), Clethra alnifolia (sweet pepperbush), Hamamelis virginiana (witch hazel), Ilex glabra (inkberry), Ilex verticillata (winterberry), Myrica pensylvanica (bayberry), Prunus maritime (beach plum), and Viburnum lentago (nannyberry). 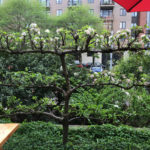 Native vines such as Clematis virginiana (woodbine), Parthenocissus quinquefolia (Virginia creeper), and Wisteria frutescens (American wisteria) are also possible candidates for espalier training. We’ve had a few days of such lovely warmth that we might forget it’s still winter. There is plenty of planning to do before vegetable gardens can be planted, so here is a Planting Calendar to help you organize for plan what can be planted first. Get those seeds out and find a warm, sunny spot for germination (or grow lights if you have them) and start dreaming of your summer harvests and next winter’s treats! Sometimes, a work space turns into someone else’s play space. 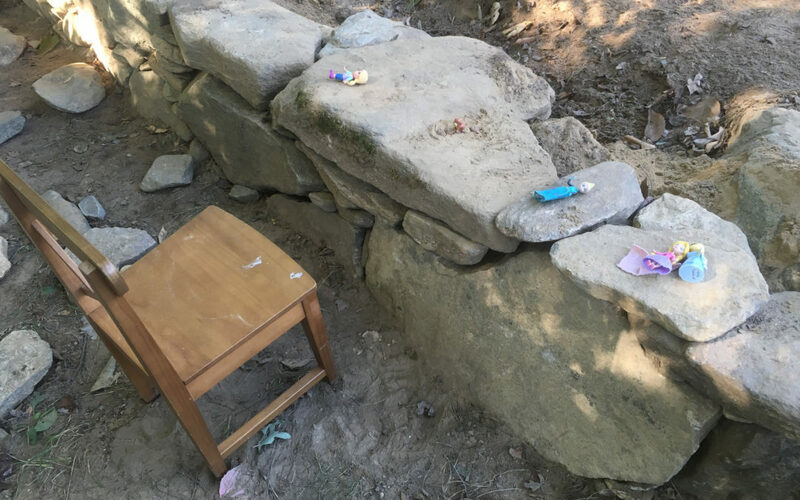 This wall is the foundation for a sugar shack, but on this particular summer afternoon, it was the princesses’ castle wall. Planning for family activities is an important part of landscape design. Sometimes people focus solely on creating specific play areas for the kids, but often, just having an interesting space is what kids need. Paths can twist and turn, as an invitation to see what is around the corner or the future site of a surprise attack. Elevation changes offer children a chance to experience viewing the world from a different perspective. Water features are possibly a place to splash, feel the coolness, see reflections, and watch insect, amphibians, and fish throughout their life cycles. 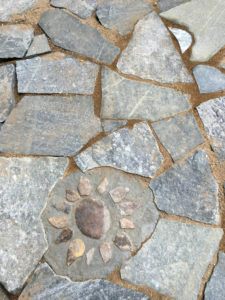 Stones of different sizes, colors, and textures can inspire thoughtful inquiry or construction. Diverse plant choices provide a variety of heights, textures, colors, smells, and tastes. Different plant heights allow kids to feel both big and small. Big plants provide hiding places where kids can see, but not be seen. Rhododendrons and lilacs become forts on the inside, fallen tree trunks become bridges or lookouts, vines create tents. 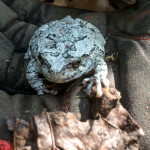 Groundcovers are a carpet from which to watch the leaves flutter or clouds race across the sky. Small plants could become troll and fairy houses, or just the place where chipmunks disappear and reappear. A variety of colors can help encourage exploration and discovery. 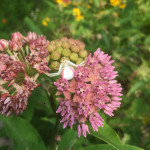 Have you even taken the time to notice what color of plants attract what type of pollinators? Blooms, fruits, and leaf colors herald the change of seasons. Different textures of plants allow kids to experience plants by sight and touch. Small, large, broad and strappy leaves can be as inspiring as the soft, velvety feel of Canadian ginger and lamb’s ear. The leathery leaves of mayapples and their flowers that can only be viewed by peeking under the umbrella-like leaves (and finding out the fruits are food for Eastern box turtles). There’s the prickly and sharp, dried purple coneflower seedhead or the smooth, silky-soft feeling of northern sea oats or the leaves of threadleaf bluestar. The rough leaves of peppermint and sage, the smooth, brittle crush of skunk cabbage, and sweet woodland phlox provide exploration through scent. Edible plants like blueberries, wild strawberries, thimbleberries, and beach plums, elicit sweet memories of summer; the tartnesss of cranberries, the sweet vanilla-banana flavor of paw paw and savory flavors of herbs can surprise. 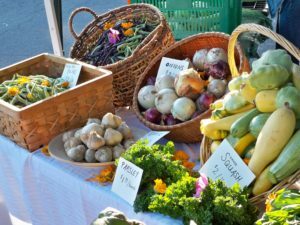 Children can learn how fruits, seeds, and herbs are grown and how they can be added to meals for nutrition and increased flavor. There are also teachable moments about how all plant fruits are not edible, and children can learn to appreciate the knowledge that these fruits provide food for other creatures, even if not for humans. There are so many different ways that landscapes and plant choices provide playful, sensory, and educational opportunities for children. Unstructered play and exploration of nature through observation, touch, smell and taste, including the nature in our landscaped yards, balconies, and porches, is a great way for children to experience the world.